The US dollar suffered its biggest fall in more than two months on Tuesday. The dollar was off sharply against most majors including the euro, the yen, the Canadian & New Zealand dollars and the British pound. The People’s Bank of China intervened in currency markets for a second day by lowering the band which the yuan trades in against the dollar by a further one percent. Many had anticipated a second move but the decision still sent shockwaves throughout the financial market as traders bet on the potential winners and the losers. The devaluation will help Chinese exporters by making their products cheaper to foreign buyers. The flip side of this is that firms importing into China will now be less competitive. The intervention by PBOC was followed by a disappointing set of data on the Chinese economy. Retail sales missed forecasts last month official figures revealed. Industrial production was also on the soft side rising just 6% on the year to July. 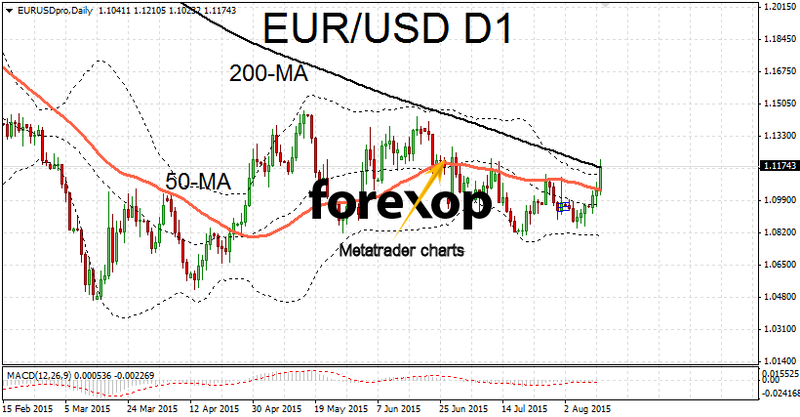 EUR/USD benefited from a weaker dollar with a strong rise above the 1.12 level. 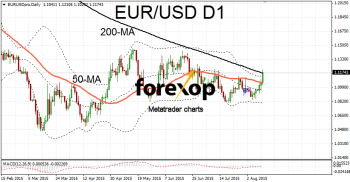 EUR/USD rallied by 1.3% as investors liquidated dollar denominated assets and converted them in the euro. In a bullish breakout the euro also broke a significant technical resistance at the 200-day moving average. This is the first full break of this resistance level since May 2014. A short term drawdown and consolidation period often takes place after such a break. If we see momentum build again the pair could force through a more significant upside breakout. Economic news from the Eurozone was decidedly mixed today. Industrial output came in at the low end of expectations. Output across the Eurozone fell by 0.4% in June – missing the forecast of 0.2%. Ultimately though, markets chose to focus on the events in China and in commodities. The Japanese yen, a traditional safe haven currency, benefited from the uncertainty in global markets and dollar weakness. USD/JPY fell one percent to 124.11 as traders switched to the yen. Commodity currencies which sold off sharply yesterday saw something of a revival today. Markets had already begun to price in further depreciation of the yuan. Today’s moves in AUD saw a corrective rally in which some of the sell-off was reversed. AUD/USD climbed back up to 0.7372. USD/CAD also fell abruptly as the markets retook some of yesterday’s gains on the USD dollar. USD/CAD was trading below the 1.30 level for the first time in two weeks. NZD/USD bounced off multiyear lows with a move back to 0.6617.